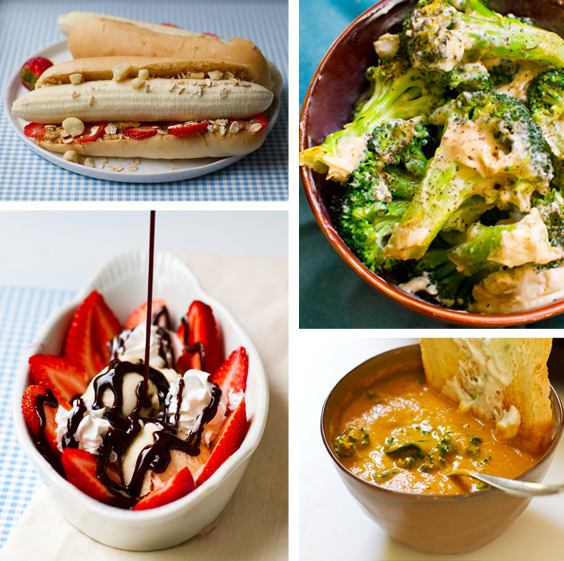 Today's Meatless Monday Recipe Round-up via my posts over at Babble's Family Kitchen include .. 'wacky' banana hot dogs, a strawberry split, easy kale sweet potato soup, banana split-dillas and more. Start today and keep meatless going all week long!.. Yay! Meatless Monday round-ups are back. I took a few weeks off (for the book) but back to posting round-ups from my Babble.com posts!.. Who says bananas get to have all the fun? With so many seasonal strawberries right now, trade in your banana split for a strawberry split! And easy sweet potato soup accented with tender green kale! This wacky idea gives you something yummy to do with any extra hot dog buns you may have this summer. Hot dog buns are the perfect fit for a banana. Add nut butter, fruit or whatever creative toppings you'd like! Broccoli is nutritious and delicious. Rich in calcium, fiber, vitamins A, C and K, potassium and manganese - this is a super easy recipe to turn steamed or sauteed broccoli into a creamy, flavorful side dish in seconds! My sister recently confessed to me that she is trying to give a more meatless diet a chance for her family and two young kids. But then she said that she "still had chicken nuggets in the freezer.." I told her about Gardein and she had never even heard of it! So this list is for her - and anyone else looking to veganize a few popular go-to kid food products. Turn lunch into a healthy banana split-fest! Using sprouted grain tortillas, fresh fruit, soy yogurt, nut butter and maybe a tiny swirl of soy whip - just for fun. About my Meatless Monday round-ups: Every other week (or so) I link to my recent posts over at Babble.com so that you don't miss out on any of my recipes. These round-ups are a great way to find inspiration for a Meatless Monday. Browse my HHL Recipe Index for many more vegan, meatless recipes!